After graduating from Central Michigan University, Agata began her career in London, planning events for a financial publishing company. Her strong work ethic and unwavering eye for detail quickly earned her an event manager position in New York City, where she went on to complete her education in Event Management from New York University. Three years of managing corporate conferences and special events later, Agata found her way back to her midwest roots in southeast Michigan. Desiring to make an impact, she joined the University of Michigan's events team, planning development fundraisers, presidential dinners and university ceremonies. 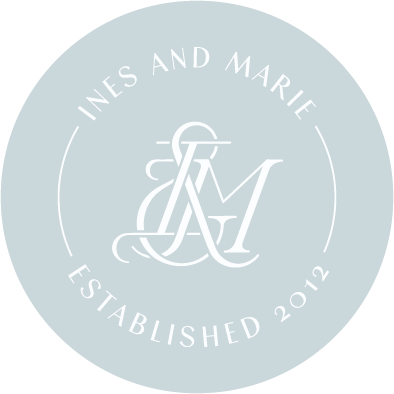 After planning her own wedding in 2012, she decided to put her skills and experience to the test and established Take A Seat Event, now Ines & Marie. In her spare time, Agata enjoys dreaming up flower recipes, entertaining friends and family, date nights out with her husband Chris, or snuggling with her children, Camden and Vivienne. J ustyna is inherently creative and talented, but she also packs a powerful professional punch with degrees in Event Management, Interpersonal Communications and Media & Production from Central Michigan University. Shortly after graduating college, she relocated to London where she managed integrated marketing campaigns on an international level. After three years abroad, she moved home to Michigan and accepted a position as a Creative Project Manager with an in-house agency in Detroit, where she oversees video production and manages digital media projects. In 2013, she joined forces at Ines & Marie with her sister, Agata, to pursue her passion for event planning. She can be found frequenting boutique wine shops, adding to her extensive hat collection, singing Salt’n’Pepa at her favorite karaoke spot or spending time with her husband, Jason. Chelsey graduated from Michigan State University in 2012 with her Bachelor's in Social Work. Her love for celebrations and family gatherings coupled with her desire to serve others quickly led to a passion in event planning. Shortly after graduating, Chelsey moved to Metro-Detroit where she met Justyna and Agata and fulfilled her calling as an Event Coordinator with Ines & Marie. When Chelsey isn't working on projects at her new home she enjoys spending time with her family and friends. Meg graduated from the University of Michigan in 2009 and earned a certificate in Event Management from George Washington University in 2015. She gained over six years of event experience working at the Milwaukee Repertory Theater, Playwrights Horizons in NYC, and the University of Michigan and is thrilled be on the Ines & Marie team. Meg lives in Ann Arbor with her husband Karl and their three furry companions Sneak, Lou & Stella. Leia graduated from Michigan State University in 2012 with a BA in Media Arts & Technology. Following graduation, Leia began a career in marketing, taking on numerous side projects along the way as her creative outlet. Wanting to pursue this passion further, Leia began interning for Ines & Marie in March 2017 and has since stayed on as a coordinator! Leia is a native Michigander, graphic designer and enjoys going on adventures with her boyfriend, Mike.